We all know about the great chocolate names in Belgium, Switzerland, France, Italy and these days the UK too, but watch out Belgium and the rest, here comes Lithuania. Bean to Bar chocolate production was a rare occurrence a few years ago, now it is burgeoning, albeit slowly, with only 150 such producers world wide. Born from the slow food movement Chocolate Naive is an ethical business deep in the Lithuanian countryside, creating interesting and wholesome ice-cream and chocolate. Many of the ingredients used are sourced from within a ten mile radius, thus building co-operation and resilience within the local community. Not the chocolate of course. Chocolate Naive use high quality beans sourced directly from growers in various regions around the world and they pay a fair price for them too. They are roasted, winnowed, tempered and conched to reflect the character and provenance of the beans. Like our own Willie Harcourt Cooze here in the UK, Domantas Užpalis is a mad visionary who believes in following his dream and has done so. For a more detailed account of the story behind the business, there is an interesting interview with Domantas Užpalis at Chocolate & Zucchini. I think I may have found the best chocolate bars yet. Every chocolate bar is like a chapter in the chocolate Naive story book. Taking you through the mountains of Peru, confessing first love, recollecting childhood memories, gazing at bees. Please enjoy our little Encyclopaedia of chocolates. As a Librarian I love to catalogue and categorise, so the packaging couldn’t have been more suited to me if it had tried. I was smitten with this chocolate before ever I got to try any. To me it represented a chocolate tasting library and I couldn’t wait to start consulting the volumes. On the back “cover” the type of chocolate used is given, along with the percentage of cocoa contained, the conch rating and the level of roast. When the front cover has been opened, there is a page of description to read and tempt you even further before you finally get to the chocolate contained within. CT likened the set up to a gene bank, but with flavours instead of seeds. He could imagine people in white coats carefully stacking and unstacking the specimens under contolled conditions. The bars weighed in at 15g each, making a grand total of 120g in the box. These were just the right size to not only truly savour the flavours, but also to share the delight. I was pleased to see there were three bars of milk chocolate to accompany the five of dark; I often find that milk is neglected in the upper echelons of chocolate making society. Starting with the lowest cocoa content and working up to the highest, CT and I applied our palates to the most enjoyable and challenging part of the exercise. Each bar had the distinctive Naive logo embossed on it. All the bars were solid chocolate, but came in a range of colours and flavours. None were too sweet and all were very smooth with complex flavours that excited the tastebuds and infused the whole palate leaving behind a delightful memory on the tongue. These bars may be small, but they have plenty of character. As is often the case, I asked CT to test these blind; he is surprisingly good at identifying the flavours and I reckon he might be a supertaster. Milk Chocolate with Hazelnut Cream – This was a praline of the best kind, otherwise known as gianduja. The creamy hazelnut melts in the mouth, filling it with unctuousness and the flavour of hazelnuts. This was CTs favourite and he expressed the desire to roll it around his mouth for as long as humanly possible. With 33% cocoa solids, this was the sweetest of the bars, but it was thoroughly decadent and delicious with the balance of hazelnut to chocolate just right. Milk Chocolate with Salted Caramel – 38% – With smells of burnt sugar I couldn’t help but try this one first – salted caramel is one of my favourite flavours after all. This was pure bliss with a whole load of flavours rolling around my tongue. Salt and caramel were definitely present, but the flavour of good milk chocolate was also very much to the fore. CT likened this one to the flavour of the skin on top of a rice pudding, but it also reminded him of another childhood favourite, Caramac, albeit an upmarket one. The salt balance was just right, augmenting the flavour but without dominating. Milk Chocolate Java / Papua New Guinea – 53% – On opening the wrapper, I noticed it smelt particularly fruity. It had a good snap and the high cocoa content gave a robust flavour with notes of coffee followed by roasted hazelnuts. It had a smooth mouth feel but was slightly drying on the palate, usually a sign of high cocoa content. Delicious. Dark Chocolate with Creamy Coffee – 65% – If I thought I could taste coffee in the previous bar, there was absolutely no doubting it in this one. This is a coffee lover’s chocolate and I couldn’t detect much else besides. CT thought this was a morning after the night before wake up type of chocolate. It was just the right side of being too powerful but its smoothness helped to balance the strength of flavour – an iron fist in a velvet glove, according to CT. Bracing. Dark Chocolate with Forest Honey – 67% – The predominant smell here was bitter. Although the taste of honey was present, the notes were more citrussy than sweet with CT detecting distinctly woody notes like that of the forest itself. Dark Chocolate with Sugar Crystals – 70% – Strangely enough, this bar smelt of tobacco and although I don’t generally chew a lot tobacco, it tasted of it too, but in a nice way. Despite the presence of sugar crystals, it wasn’t too sweet. They gave a bit of crunch, which encouraged munching rather than leaving the chocolate to melt in the mouth – as one really should with this quality of chocolate. The texture was slightly granular reminding CT of Kendal mint cake thus giving the tongue something to rub up against. Both CT and I liked this one despite thinking it was going to be too sweet. Dark Chocolate Trinidad and Tobago – 70% – With its smoky notes, this bar was reminiscent of Lapsang Souchong tea. Whilst it had a very smooth texture and was creamy, it was also drying in mouth presenting us with a cognitive mismatch, which made us sit up and think. Peru Pure Nacional Dark Chocolate – This limited edition 78% bar was smooth and fruity. Nacional was a variety native to Ecuador, but now only grows in a hidden Peruvian canyon. The trees grow at the highest altitudes ever recorded and have a high percentage of white beans in the pod. It was strong and robust but very smooth. When it comes to dark chocolate, it is unusual for CT and I to want more than one bite at a time. This however, was distinctly moreish. 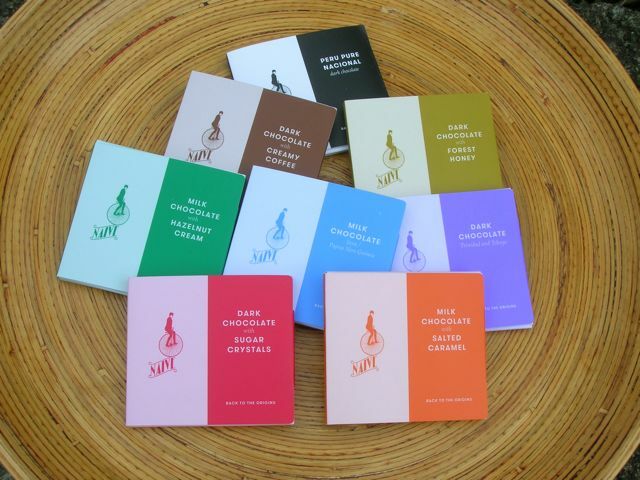 If you’d like to try some of this exciting chocolate, you can buy bars direct from the Chocolate Naive website. This stuff is delicious. A Baltic crusie would combine neatly with a chocolate tasting experience. Anyone else like that idea? Hmm, think I could be up for that. Would certainly love to visit the Naive dacha. The one I’d like to try most is the dark chocolate with forest honey. Mmmmmm! I much refer Cadburys to all those other chocolates so look forward to trying the Lithuanian chocolate.